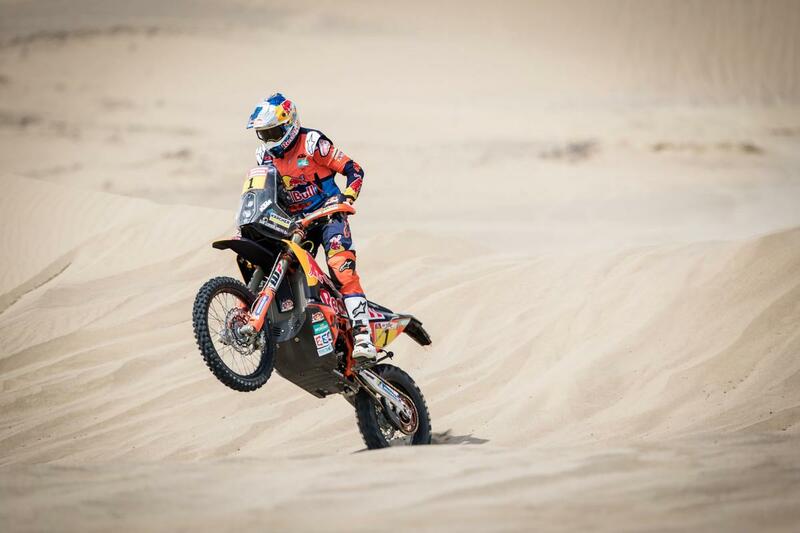 In what could turn out to be a significant day on Dakar, Brit Sam Sunderland exceeded expectations by winning the stage despite starting from seventh position. The factory KTM rider was the primary beneficiary of a mistake by Joan Barreda (Honda) Adrien Van Beveren (Yamaha) and Matthias Walkner (KTM) who all made a significant navigational error early on in the 296km stage. The result means that Sunderland, who had dropped to fourth overall in the standings after stage two, is now back on top after the third stage that ran from Pisco to San Juan De Marcona. And while his lead is anything but unassailable, it’s useful minutes and not seconds with him now leading Argentinian Honda rider Kevin Benavides by 4m 38s. Speaking to MCN, Sunderland said: “To be honest I was hoping to catch up even more time because there was a lot of off-piste but I made a few mistakes. In the first part of the stage I was pretty fast, but in the second part I got lost twice and had a crash. “So far it’s been good to win two out of the three stages, but I’d rather not win a stage but win the race. It’s good to be at the front and fast, but we’ve got a long way to go. These first few days have been heavy, tough navigation and really physical riding. It’s tiring. Because we were over lapping with yesterday’s stage there are a lot of tracks so you’re following cap headings only as the road book doesn’t really seem to make much sense at times. I’m just trying not to get too stressed about it when the navigation gets difficult and just work through it. Tomorrows stage runs from San Juan De Marcona to San Juan De Marcona and features a 114km liaison and a 330km timed special stage which includes a stretch of dunes over 100km long. It is also a mass start meaning rows of 15 bikes will set off at the same time with each row being separated by five minutes.